My parents have a cherry table stored in their basement. It belonged to my Grandpa and Grandma Dora. It’s a beautiful, solid table, with lots of carved wood and intricate patterns. It has numerous leaves that fit into it, making it enormous in length. I’ve always admired it and said that someday I hoped it would be mine. My dad has told stories that during harvest time he can remember that cherry table, with all of the leaves in it, stretched out in their house with a large group of farm hands eating around it. Farmers in the area would go together, farm to farm, helping neighbors bring in their crops, living by the adage, “Many hands make light work.” When they would come to my grandparents farm, Grandma Dora, her mother Edith and the wives of the men in the fields would spend hours cooking and baking, trying their best to fill the men up with a hearty meal before sending them back out to the fields. 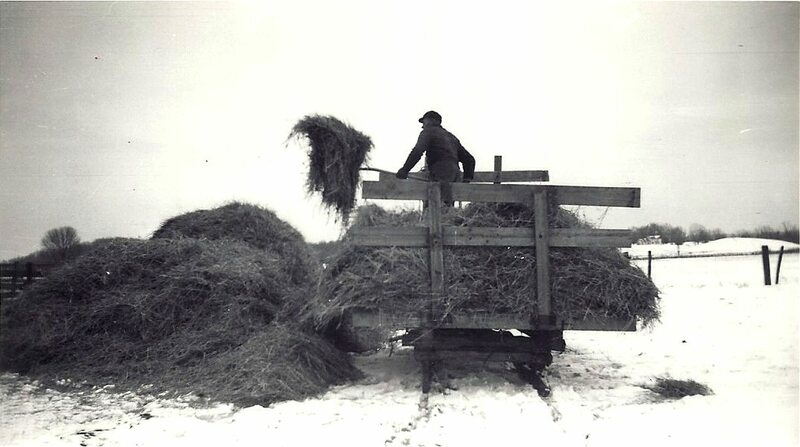 Grandpa on his hay wagon that was used during harvest time. 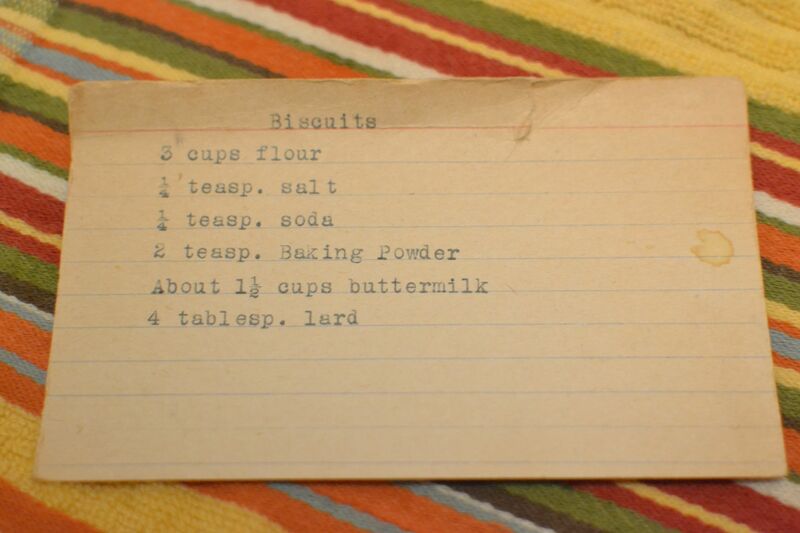 I found Grandma Dora’s recipe for homemade biscuits in her recipe box. I’m sure she included them with the filling meals for the farm hands. 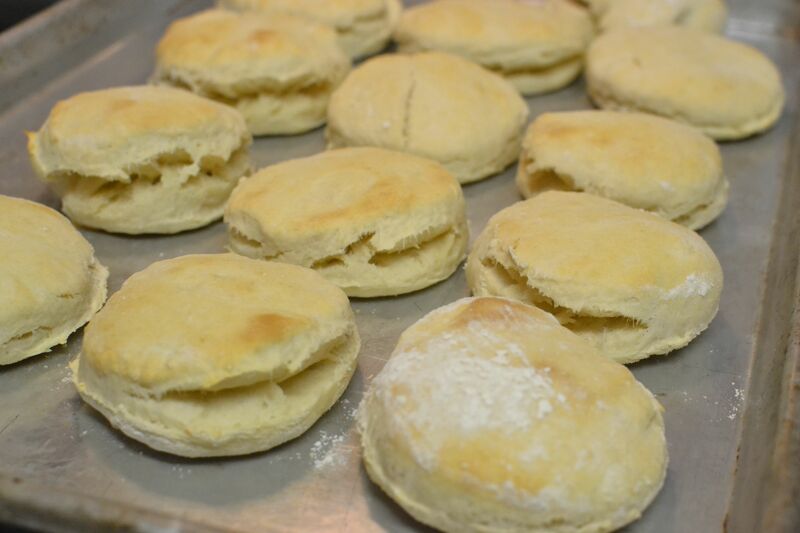 I had never made biscuits from scratch before. 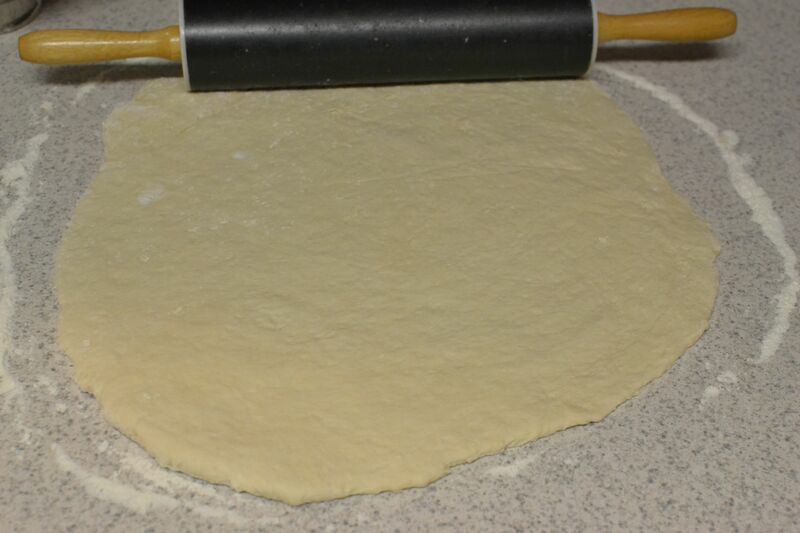 Normally when I see a recipe that requires a rolling pin, I usually lose interest pretty fast. 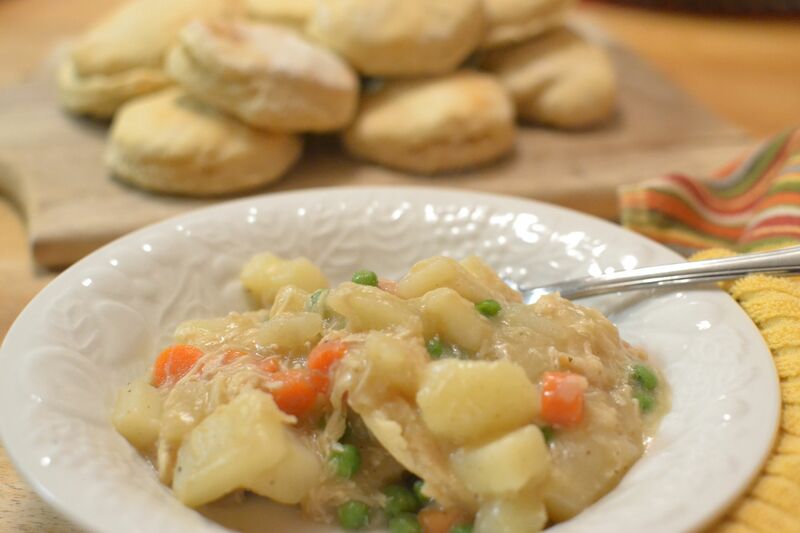 But I had a recipe in my own recipe box for Creamed Chicken Over Biscuits that I had never made, but always intended to, so this was my chance. I would whip this up for dinner! 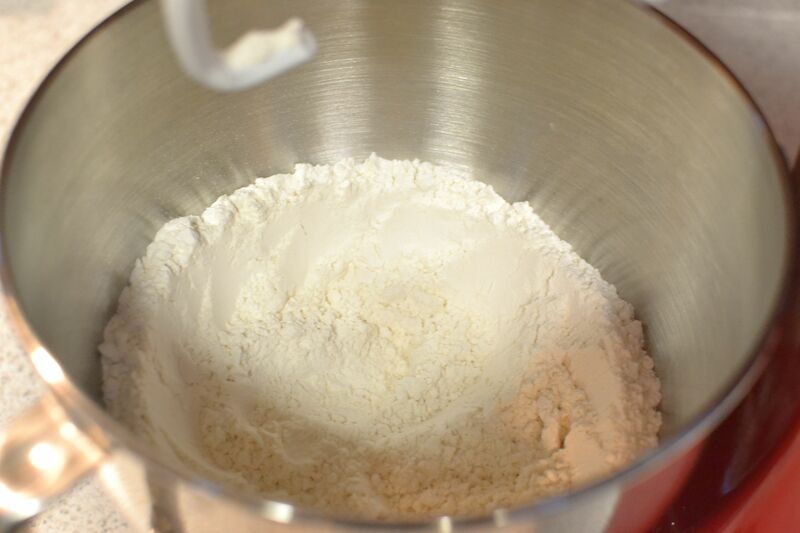 Combine all dry ingredients in mixing bowl. 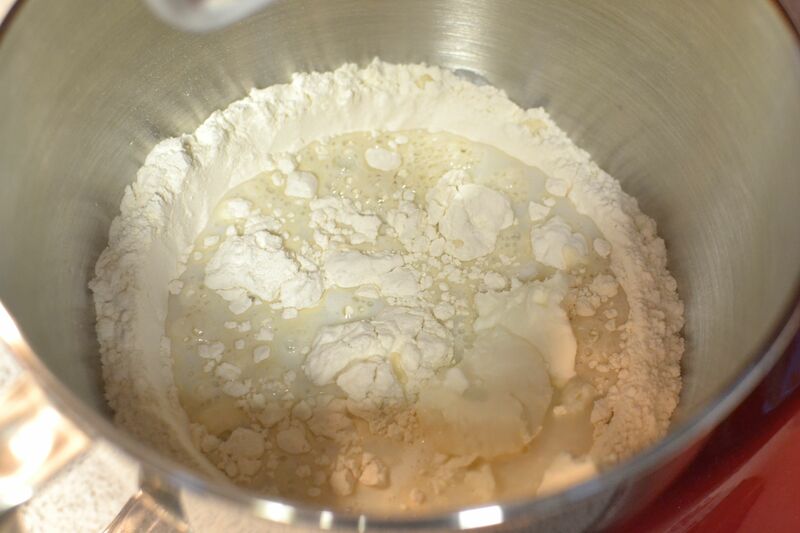 Add buttermilk and shortening. 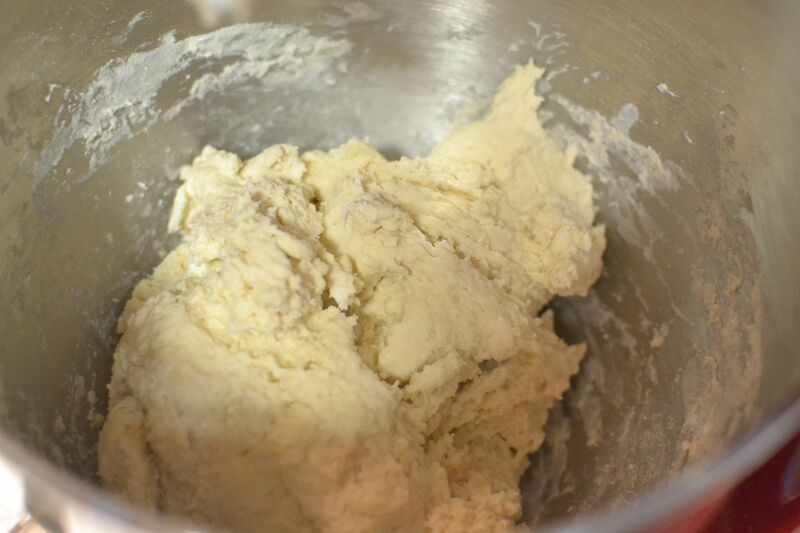 Mix until soft dough is formed. 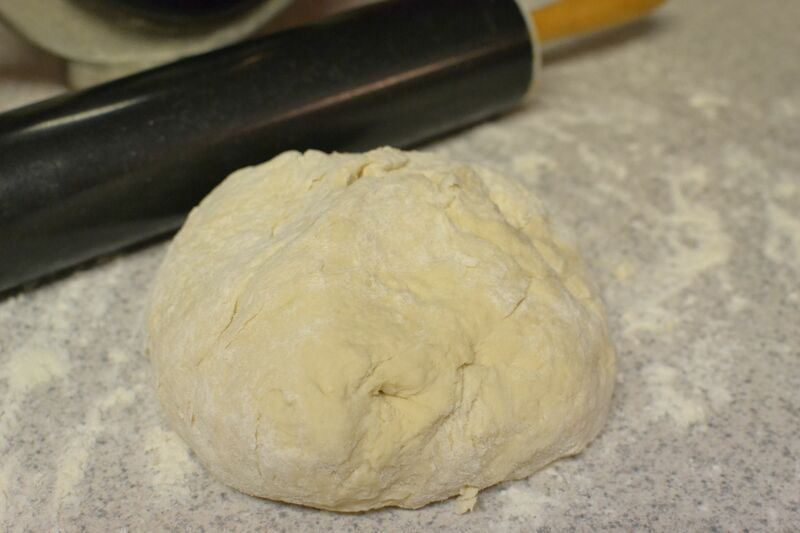 On a floured surface, knead a few times and roll out until dough is about 1/2 inch in thickness. 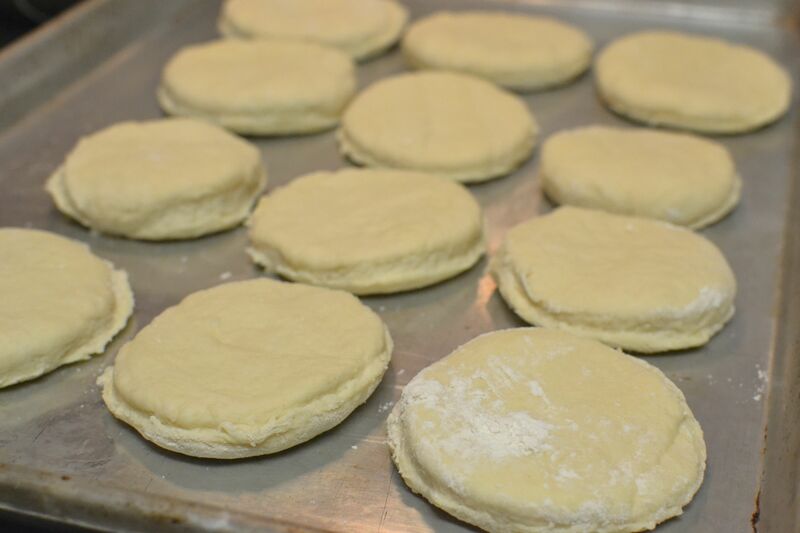 Cut with a floured biscuit cutter. Place on ungreased baking sheet. Bake at 450 for 10-12 minutes or until golden brown. I added all of the dry ingredients into my mixing bowl. Using the dough hook attachment on my Kitchenaid (though just a regular mixer attachment would be fine), I mixed the ingredients until a soft dough formed. After flouring the counter, I kneaded the dough a few times until it felt like a good consistency for rolling out. I rolled out the dough until it was about 1/2 inch thick. 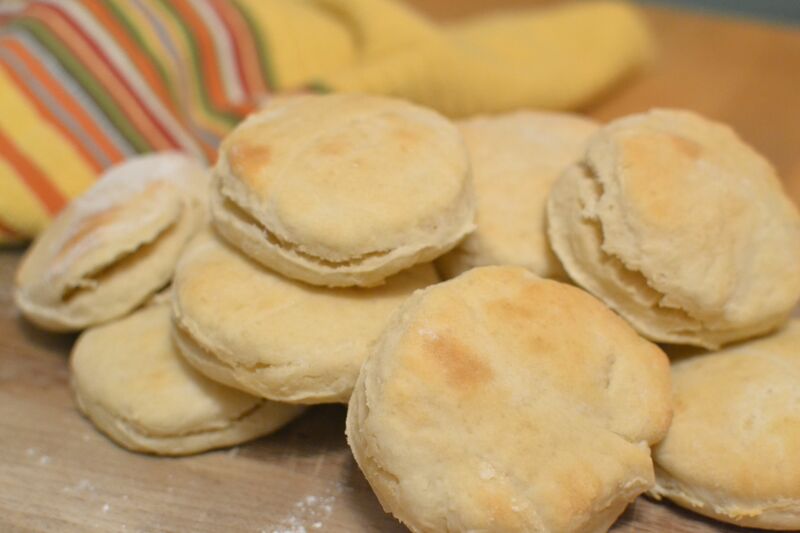 If you’d like a thicker biscuit, than don’t roll it quite as thin. Since I don’t have a biscuit cutter, I floured the mouth of a glass jar and used that to cut the dough. I then placed them on an ungreased baking sheet and popped them into my preheated oven. I baked them for about 12 minutes and pulled them out as they were starting to brown and open around the middles. They were beautiful! Soft and flakey, splitting in the middle. They even smelled delicious! I couldn’t wait to try them with dinner. I covered them to keep them warm and made the Creamed Chicken, which is basically like the inside of chicken pot pie. The biscuits were delicious! They were cut open and covered with heaping ladles of steaming Creamed Chicken. It was a warm, hearty meal, one that reminded me of something that Grandma Dora must have prepared for the farm hands all those years ago. 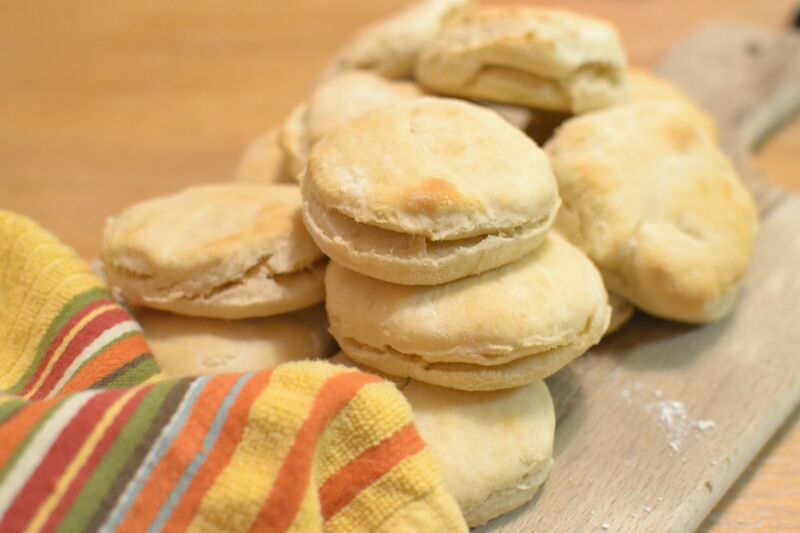 This entry was posted in Breads, Side Dishes and tagged baking, baking powder biscuits, biscuits, farm cooking, grandma's cooking, home baking, homemade, scratch baking, scratch cooking by GrandmothersRecipeBox. Bookmark the permalink.